Simon & Garfunkel is a music group founded in 1963 in Kew Gardens Hills, New York, New York. A large amount of people listen to Simon & Garfunkel on Spotify: the group has around 1.8 million followers and a popularity score of 76 out of 100 as of 2018. The movies From the Big Apple to the Big Easy: The Concert for New Orleans (2005) and Simon & Garfunkel: Old Friends Live on Stage (2003) featured Simon & Garfunkel. A popularity score of 76 out of 100 and 1.8 million followers as of 2018 makes Simon & Garfunkel one of the most popular groups on Spotify. Bookends and Bridge Over Troubled Water are some of the more popular Simon & Garfunkel albums. Notable tracks from these albums include Mrs. Robinson, The Boxer, and Bridge Over Troubled Water. Mrs. Robinson is Simon & Garfunkel's most popular track, scoring 76 out of 100 on the popularity scale. The Boxer and Bridge Over Troubled Water have popularity scores of 71 and 70, respectively. The Spotify popularity score is on a scale from 0 to 100 and reflects the number of times the song has been played and how recently it has been played. As of 2018, Simon & Garfunkel has appeared in about 2 movies. 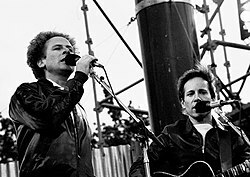 Some of the most recent Simon & Garfunkel movies include From the Big Apple to the Big Easy: The Concert for New Orleans and Simon & Garfunkel: Old Friends Live on Stage. From the Big Apple to the Big Easy: The Concert for New Orleans was released in 2005. Simon & Garfunkel: Old Friends Live on Stage was released in 2003.